I write letters, on paper, and send them in the mail - as in, put them in the mailbox for the mailman to pick up, who then brings them to the post office where they get sorted. The letters then go to another post office to get sorted, and then they end up in the addressee's mailbox. Tada! Remember when snail mail (of course, not called snail mail back then) was the norm for all correspondence and not e-mail? 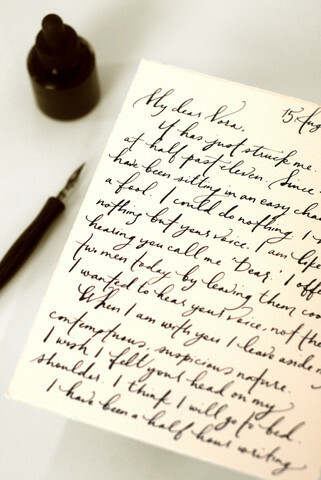 E-mail does have its place in today's world, but love letters are special and deserve the old-fashioned pen and ink. Write a letter (on paper) this Valentine's. Want to really make a statement? Have your words transcribed in beautiful calligraphy by Bryn Chernoff of Paperfinger. Written on Italian stationary and sealed with wax, truer words could never be more lovely. Thanks for the share, swissmiss!